It’s almost a year exactly since the sport’s governing body, the FIA, announced that it was to introduce a radical and controversial cockpit protection device known as the ‘Halo’ for the 2018 season onwards. The decision taken during last year’s Hungarian Grand Prix weekend. The move to make it mandatory in 2018 drew mixed reactions from drivers, teams and the wider F1 world. Whilst nonsensical to argue against enhancing safety in an activity where the dangers are inherent, Formula 1 is a sport full of tradition and history. Grand Prix racing has always been an open-cockpit formula and its heroes have been forged not only through their capricious speed, but also through courage in the face of danger. Moreover, the device is considered by some to be contrary to the ethos of F1. Last weekend, the decision to take the radical step in safety appeared to be fully justified after Fernando Alonso’s McLaren came down on Charles Leclerc’s Sauber, having been launched into the air by Nico Hulkenberg in a frightening first corner incident. It proved that the reality now is that as safety innovation advances, so the probability of injury and death in high-speed accidents has reduced significantly – and the halo is another stop in this direction. In spite if the strength of modern racing cars, infrequently drivers are still seriously injured and killed in top level motorsport, and frequently because of head injuries sustained in open cockpit racing cars. Gone is the bloodthirsty time of the 60s and 70s, when some fans arguably turned up for the thrill of the hunt, where grisly high-speed accidents were commonplace in an era morbidly known as the ‘killer years’. While it is arguable whether Jules Bianchi, the young French starlet, who died tragically following head injuries sustained in the 2014 Japanese Grand Prix, could have been saved by the halo, it is certainly the case that it may have protected drivers such as IndyCar star Justin Wilson and Formula 2 driver Henry Surtees from the airborne debris that ultimately claimed their lives. 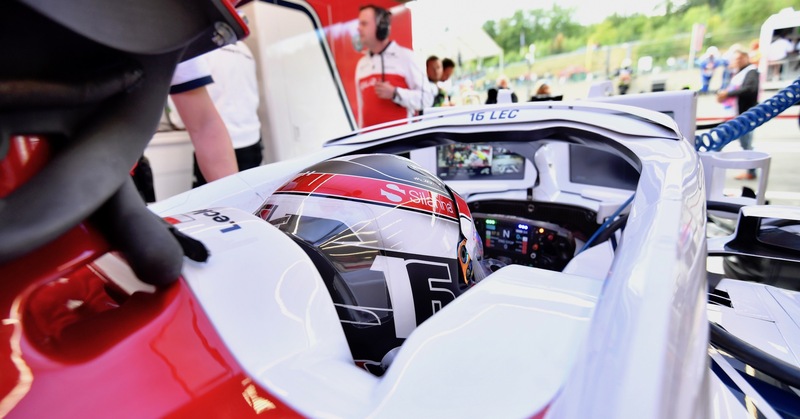 The halo, capable of supporting 15 times the static weight of a 2018 F1 car, came out on top of FIA tests over similar-trialled devices such as the shield, a more traditional Perspex-windscreen. The shield was tested for one lap at the British Grand Prix by Sebastian Vettel in the Ferrari, before the four-time world champion complained of dizziness. Charles Leclerc of Alfa Romeo Sauber during the 2018 F1 Belgian Grand Prix. © Sauber. The aesthetics of the ‘flip-flop’ design has been met with criticism, while it has been argued by some that it is an unnecessary safety measure and could make driver extrication more difficult in the event of a serious accident. Detractors have also argued that there was a carbon copy incident of this year’s incident in 2012 when it was Alonso who had a narrow escape as Romain Grosjean’s car narrowly missed the Spaniard’s head, and that a halo would also have had impact marks. For now, though, and with so little testing done on shield-style devices, it appears that the Halo is the only viable immediate solution. And it is something that Leclerc, for one, was extremely grateful for having after his near miss at Spa. Top image: Charles Leclerc of Alfa Romeo Sauber at the 2018 F1 Belgian Grand Prix. © Sauber.